In order to build power for AAPI women and gender non-conforming people, we need your support to sustain our resistance Beyond the first 100 Days of Trump's administration. Help us reach our fundraising goal of $10,000 by May 31! Donate here or visit www.napawf.org/donate! On Thursday, May 25th, the Fourth Circuit Court of Appeals in Richmond, Virginia announced that it would not reinstate the travel ban in a new executive order halting travel from six Muslim-majority nations. The Court struck down the travel ban on the grounds that it discriminates on the basis of religion. This is President Trump’s second attempt at executing such a travel ban from Muslim-majority nations in the last five months. The previous ban was also halted by the courts. This new order is expected to now rise to the Supreme Court. 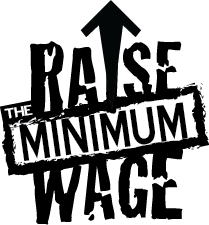 On May 25th, Democrats from both the House and Senate gathered to introduce a new federal minimum wage bill that would raise the minimum wage to $15 an hour by 2024. If the Raise the Wage Act passes, it would be the first time in a decade Congress has addressed the federal minimum wage. Read more about the Act’s introduction! Learn more about NAPAWF’s work on pay equity and raising the minimum wage! Read NAPAWF's statement applauding the introduction of Raise the Wage Act. On May 23rd, the Trump administration released their newest budget. Trump’s plan slashes $3.6 billion in spending over the next ten years by targeting key anti-poverty measures, including SNAP and Children’s Health Insurance. 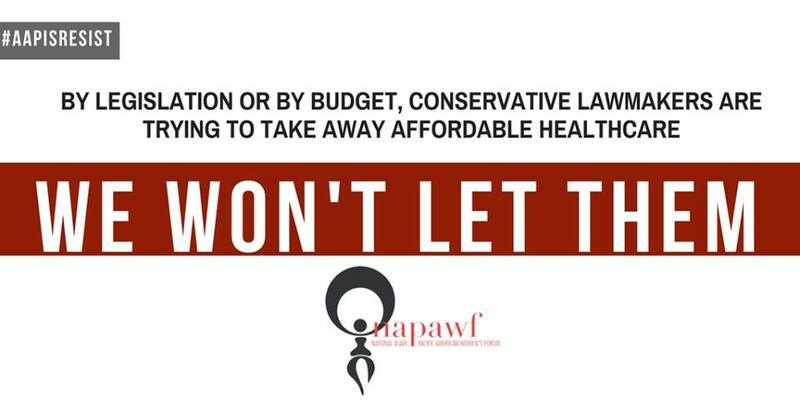 Read NAPAWF’s full statement in response to the budget proposal here. On May 25th, the Congressional Budget Office (CBO) released a new report on the economic outcomes of the Republican repeal of the Affordable Care Act, the American Health Care Act (AHCA). The CBO report shows that 23 million people in the United States would lose health insurance coverage under the AHCA. One-sixth of the population would live in areas where access to coverage will become unstable unless patients were already covered by employer- or government-provided health insurance. Under AHCA, protections for patients with pre-existing conditions would weaken or be eliminated, leading some Republican lawmakers to regret their votes. Read NAPAWF’s statement on how the AHCA and Trump’s budget harm AAPI women, transgender, and gender non-conforming people here. Read NAPAWF’s updated fact sheet, created along with the National Latina Institute for Reproductive Health (NLIRH), In Our Own Voice: Black Women’s Reproductive Justice Agenda, and the National Partnership for Women and Families, on how the AHCA harms women of color. On May 23rd, APABA-DC reenacted the trial of Vincent Chin’s killer. In June 1982, Chinese-American man Vincent Jen Chin (May 18, 1955 – June 23, 1982) was brutally attacked with a baseball bat in Detroit, Michigan. Chin died in the hospital four days later. Chin’s killer was Ronald Ebens, an autoworker, who confessed to the crime. Ebens never spent a day in prison for the murder of Vincent Jen Chin. Learn more about the case from The New York Times. Order Who Killed Vincent Chin?, a documentary about the case featuring NAPAWF founding sister Helen Zia. Find out about APABA-DC and get involved! Asian Pacific American Heritage Month lasts through the end of May! Throughout May, NAPAWF will be celebrating APAHM and featuring a fierce AAPI activist who made (or is making) history! This week’s activist is Helen Zia, who was honored this week at the Multicultural Media Correspondents Dinner on May 25th as Print Journalist of the Year! Learn more about Asian Pacific American Heritage Month! The Congressional Asian Pacific American Caucus’s celebrates APAHM! Check out other fierce AAPI activists NAPAWF has lifted up! May 30, 7pm EST: The Center for Asian American Media is holding a Facebook Live Conversation with Filmmakers on Tuesday, May 30th at 7:00pm EST #MyAPAlife! Asian Americans Advancing Justice is still accepting applications for their Youth Leadership Summit until May 31st! Apply now. June 6, 8:30am - 5:30pm EST: Language Access for Voters Summit at Northern Virginia Community College in Annandale, VA. Register to attend here! The Center for Asian Pacific American Women is accepting applications to its 2018 Asian Pacific American Women’s Leadership Institute (APAWLI) geared toward AAPI women who have at least 8 years of experience. Applications are open until June 6th. Nominate someone you know for AARP's Asian American and Pacific Islander Community Hero Award! Click here for more details. NAPAWF is hiring! Click here to see the opportunities. Missed last week's AP(Eye) on the Hill? Click here to catch up!